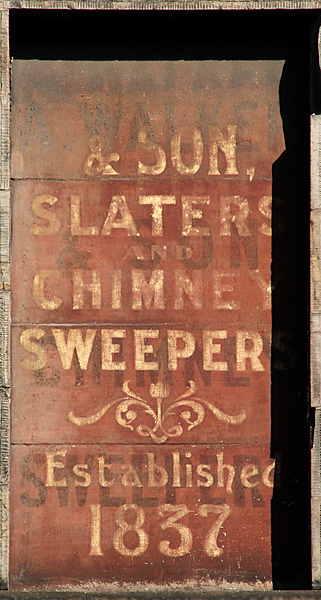 This sign set high into a closed gable window has two visible sets of lettering. 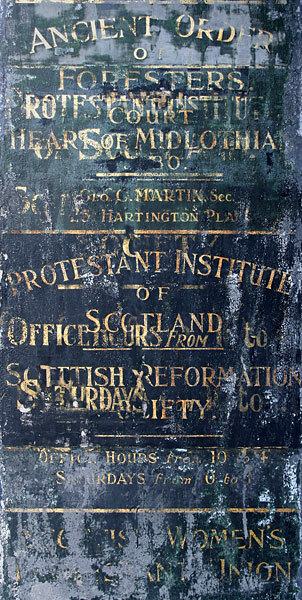 The rust coloured ground still reverberates against the black of soot soaked stone. 02 EDINBURGH | St Vincent Street, in the New Town. 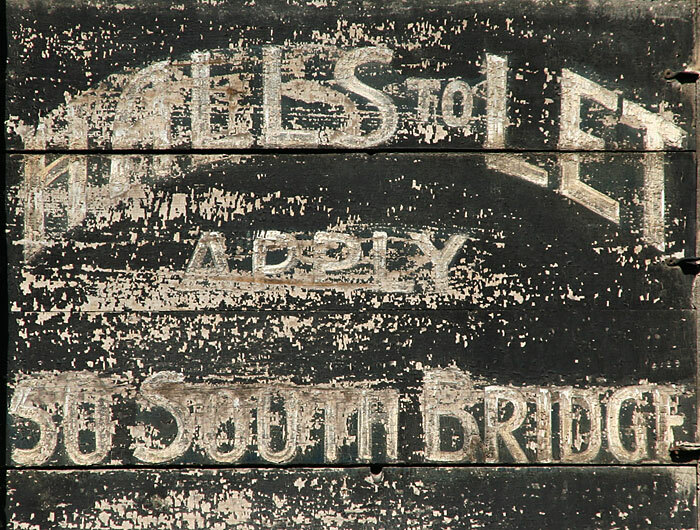 Some of the early hand-painted street names are still visible even though they have long been replaced by cast iron. One end house on St Vincent Street has two painted ghosts. 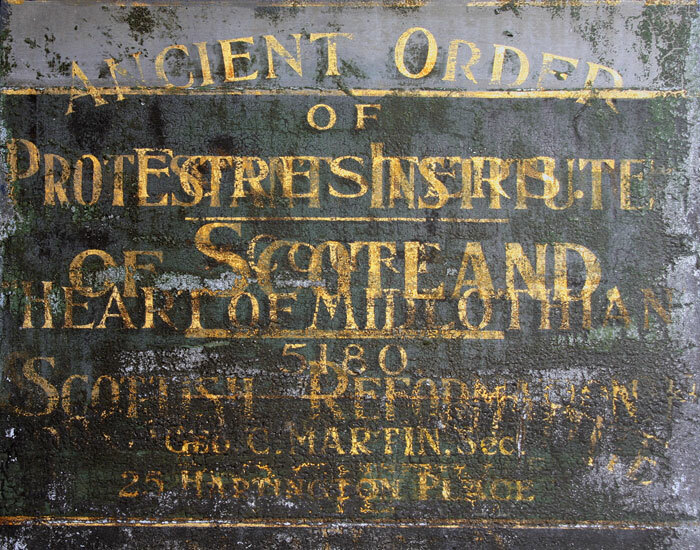 This is a detail from bands of lettering painted across the long red sandstone facade of a building in Nicholson Square and advertising Martin's as past manufacturers and wholesalers of a large range of goods including baskets, hardware, walking sticks, leather goods and woodenware. 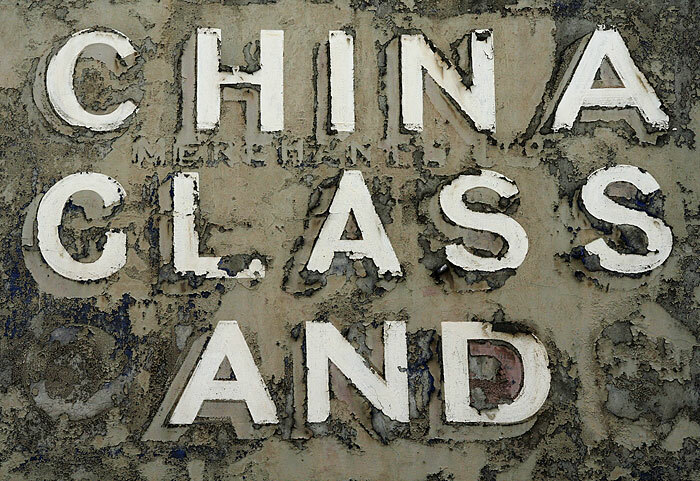 A painted wooden signboard fixed to a building on Nicholson Street. Lettering painted directly on to the gable wall in narrow side access to a shop on Nicholson Street. A partner board placed on the other side of the same doorway. 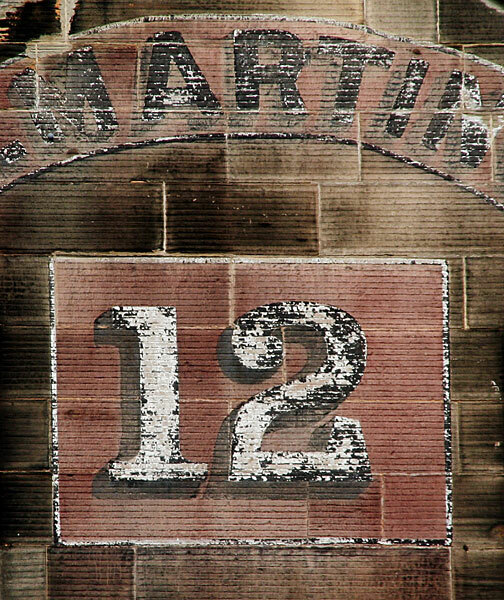 A boldly painted street number on the fascia board above the display window of a small shop. 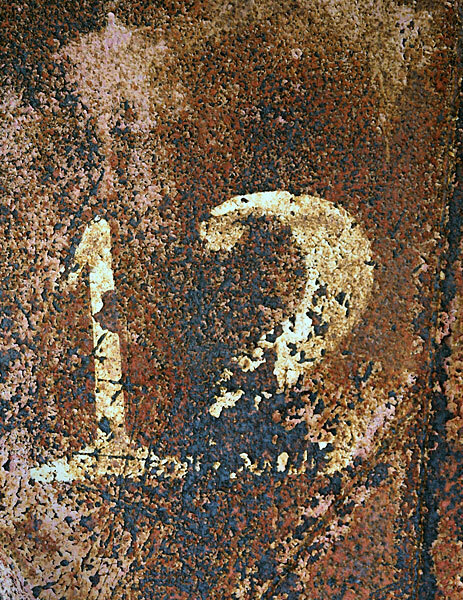 This is one of a series of decaying numbers painted on the rusting undersides of a block of abandoned animal feed silos down by the harbour. 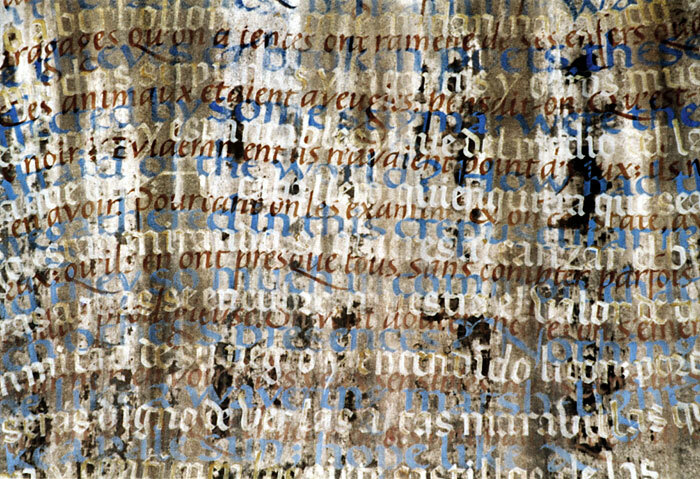 This is a small detail from a series of lettered panels between the window bays on the side of a decaying Romanesque church in this street close to La Rambla. 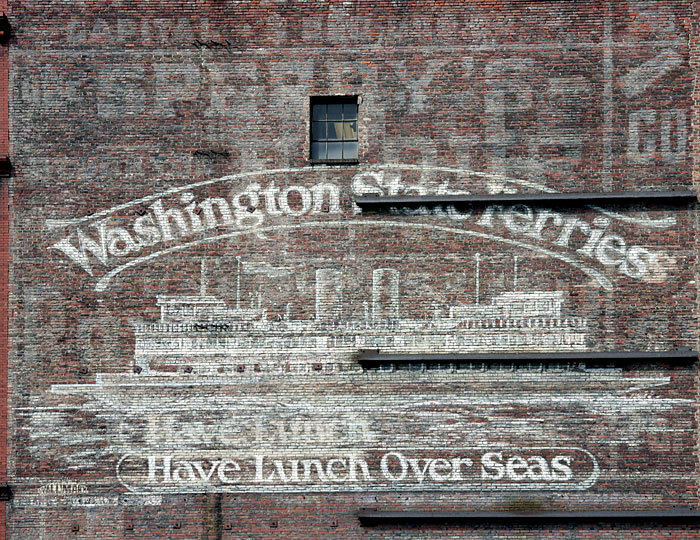 This large expanse of wall in the Pioneer Square area carries early advertisements for the Washington State Ferry services that operate out of Seattle to destinations such as Bainbridge Island and Bremerton, with sailing times of forty and sixty minutes. Jerome was established as a copper mining town in 1876. Its population reached 15,000 in the 1920s but declined to less than 100 by the 1950s as mines closed. 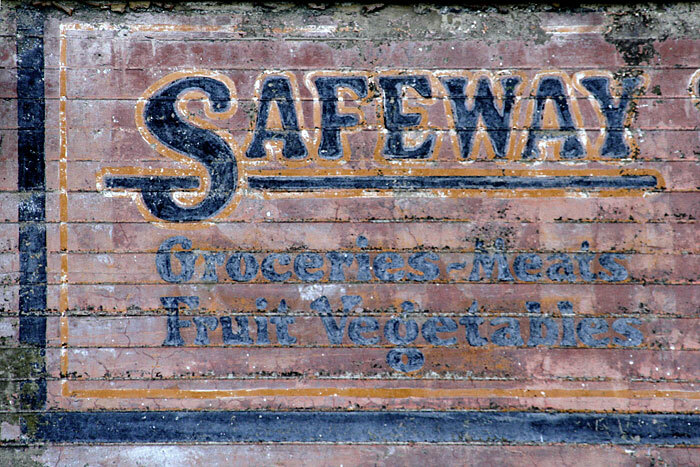 This Safeway sign on Main Street once promoted a grocery store: its company successors are numerous elsewhere. 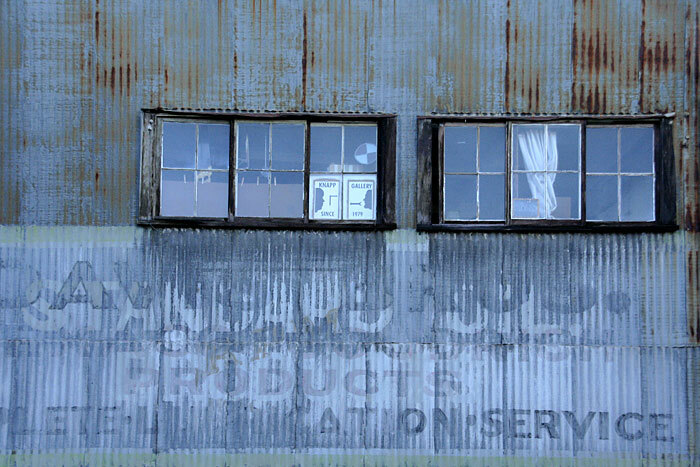 This garage on Main Street and many other derelict houses and businesses line streets that zig-zag up the steep and sometimes unstable Cleopatra Hill on which the town stands. Its some 400 residents now promote it as a ghost town but one that has active shops and activities with an arts base. 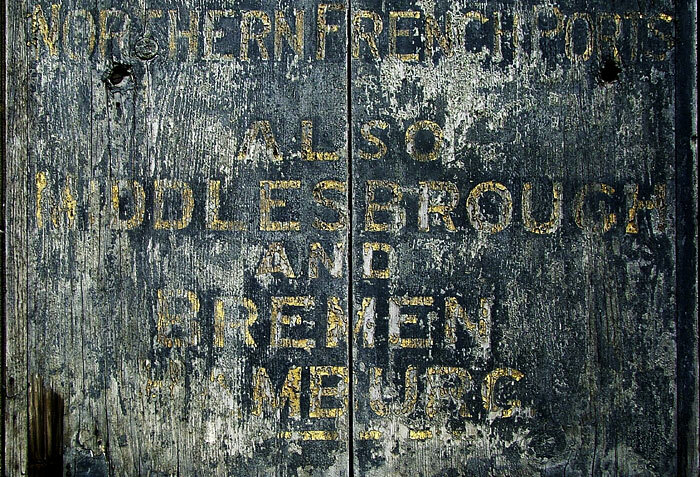 This recently restored hand lettered board is inset into the corner of a Quayside building that once housed the Company's offices. Formed through the merger of four maritime businesses in 1904, the Company operated scheduled passenger and freight services from Newcastle to London and the Continent. Coast Lines bought the fleet in 1943 and operated until 1976. Originally a stage theatre designed by William B.Parnell in 1867, it re-opened as the Stoll Picture Theatre in 1919. 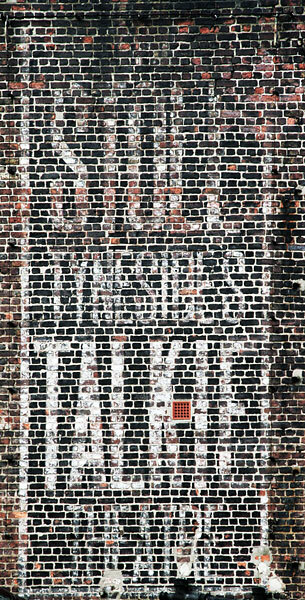 This recently uncovered gable-end sign describes it as "Tyneside's Talkie Theatre". In 1974 it reverted to its original purpose and now operates as the New Tyne Theatre.